Walking up to the door to Mr Fogg’s Society of Exploration, you’re greeted by a hostess dressed head to toe in what appears to be a historically accurate explorer’s outfit. Complete with the old school pith hat, belted safari fit and all, she gives you a warm smile and asks for your booking name. Cluttering the host desk are the kinds of trinkets you might find in an explorer’s messy office… if it were the 1800’s, that is. Vintage style record players and antique treasure chests stack atop one another, with framed paintings of the Victorian era hanging quaint along the walls. It soon becomes clear you’re about to embark on a riveting adventure to one of London’s most exciting new cocktail bars. Following the explorer theme, you watch it remain strong as you make your way from the stairwell to the hall, right through to the main bar where you’re seated on plush couches and introduced to the menu. 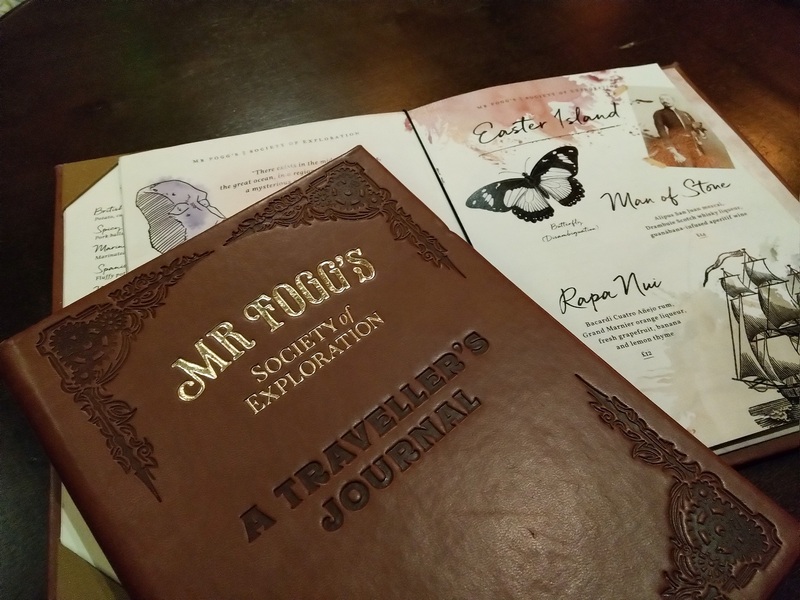 The menu, a quality, leather-bound book with yellowish pages reads ‘Mr Fogg’s Society of Exploration: A Traveller’s Journal’. As you open it, hand-drawn illustrations guide you from one page to another. It’s a travel of the tastebuds, exploring worldly flavours in the form of specially crafted cocktails. Finally making your mind up on your cocktails of choice, you order the Man of Stone and Cresting the Summit, alongside a cheese platter to share. Enjoying the ambience of a relaxing Victorian era setting, the space leaves you feeling as though you’ve travelled back in time. Waiters and waitresses are dressed in theme, wearing waistcoats and ties and frilly blouses with long draping skirts. To your left, a vintage style train carriage seats excitable customers at the far end of the bar. Nearby is the ‘Map Room’; an enclosed space filled with decorative maps and other such ornamental objects, offering an intimate space for customers to enjoy some privacy in the company of their loved ones. The whole atmosphere seems to offer more of an experience than simply a night out. 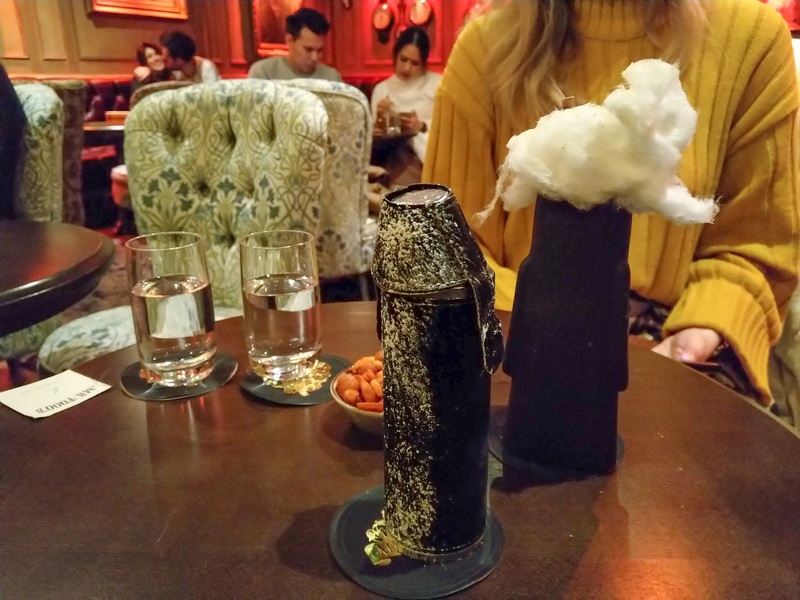 When the cocktails arrive, you’re surprised – pleasantly so – at the immaculate and rather quirky presentation. The Man of Stone comes aptly served in a stone tiki cup with pink fairy floss garnish; being a mescal cocktail, it expertly fuses a smoky yet sweet flavour profile. The Cresting the Summit is served in a vintage flask, complete with a tiny cup that doubles as a lid. Combining the unique flavours of spiced-butter-infused English Breakfast tea, yoghurt powder and Metaxa 12 Star, it was a spirit-forward drink that was softened perfectly by the infusion. Upon reflection, Mr Fogg’s Society of Exploration has been one of the most interesting bars we’ve enjoyed whilst here in London. It’s got this speakeasy, kinda historical quirk about it that makes it so different to anywhere else we’ve been. We scored an offer at Mr Fogg’s with INTO App, so those of you on the app, we’d highly recommend snapping up the offer! For those not on INTO, we simply recommend grabbing a table and enjoying a cocktail or two, whether as something a little bit fun for date night or for a casual night out with friends. To find out more about Mr Fogg’s (and who he actually is), click here. Previous articleWe landed The Influencer’s Diary Blogger of the Week! Next articleEver tried pasta from a giant cheese wheel?